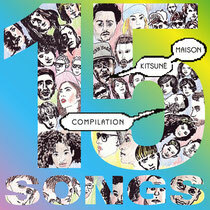 The Kitsuné Maison series reaches its 15th edition and is jam-packed with new rising stars, melodies and possible hidden gems waiting to be discovered. Having launched the careers of countless critically acclaimed acts over the years, from Two Door Cinema Club, to Is Tropical and Citizens!, Kitsuné has found its balance as one of modern music’s eclectic labels. The Parisian imprint has always espoused originality and quality and Maison 15 firmly cements Kitsuné’s taste-maker reputation. It embraces an exciting vision of pop music in its ever-changing form and delivers a solid collection of songs featuring artists like Portland, Years & Years, Jonny Pierce, Techniques, The Swiss, Chela and more. The famous Maison artwork depicting caricatures of Kitsuné’s artists & friends is getting a new make over for its 15th edition. Check out the mini mix below, compiled by Jerry Bouthier. The album is out 15 October.